Well, first, we do NOT collect cookies on our website - we think cookies should be saved for eating! Plus the chocolate chips mess up the intertubes. You probably already know that Yarnivore collects your name and email and we thought you'd like to know what happens with that info. Nothing. Really. We don't share it with anyone. We keep your prior purchases saved under your name so that if you forgot what "that pink fuzzy yarn" was, you can call us and ask. We also need your name for classes, and your email so we can send you messages (like that time that we had to close because the roof was pouring water on the floor). If you've been to the shop in the last few weeks, you'll notice we're also asking for your cell phone number and your birthday. We want your phone number mostly so that we can call or text you if you accidentally leave something in the shop (this happens several times a week), but our new system can also send you reminder texts if you have signed up for a class! Handy, right? And your birthday? That's so we can send you a Happy Birthday greeting WITH A COUPON! We absolutely do not EVER want to spam you. If you don't want to get the newsletter, then we will take you off the list. No problem. No questions asked. There's an unsubscribe link at the bottom of every newsletter. Mostly, the news is this newsletter! This is our first one sent from the new system. We're still figuring out some formatting issues, but we're excited to keep making it better. We want to give you content you actually WANT to read. Have suggestions for the newsletter? We'd love to hear them - send them to info@yarnivoresa.com or to wendy.yarnivore@gmail.com! Today's hint is an easy way to save money on yarn! Call, email, or stop by and tell us your birthday! We'll send you a coupon for a birthday present! 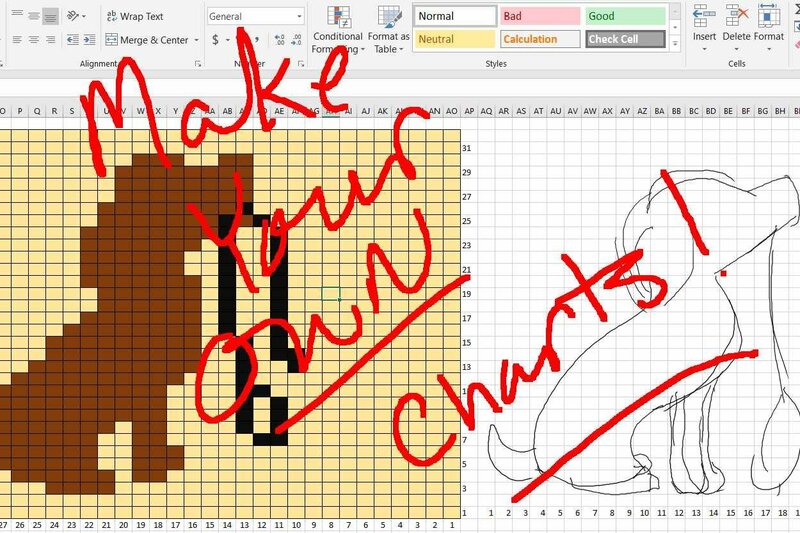 Learn to unleash the power of your computer to make and alter knitting charts. This makes it easy to add or remove repeats if you want a wider or narrower piece. You’ll also learn to make a color chart from any line drawing, using Excel® and PowerPoint® together to turn almost any clip art into a knittable pattern! Prerequisites: Suitable for knitters of most skill levels. Take the next step! Learn to increase and decrease (intentionally!) and crochet in the round while working Linda’s Quick and Simple Hat Pattern. Want to learn how to read a crochet chart? This is an easy start! Crochet charts are a universal language and they help you see what your project will look like. Filet crochet is worked in a grid, using only chain and double crochet stitches. Because we use just two stitches, it's easier for you to learn chart reading. Socks are a great project for any knitter trying to understand how different types of shaping work and will do more to improve your overall knitting smarts than any other single project. Learn to make a perfectly-fitted top-down sweater, with your choice of sleeve and neckline, in your favorite yarn. You’ll learn to take charge of your knitting, to knit seamlessly and to fit your own figure! You can make it light and short- sleeved for the summer, or heavy and warm - your choice! To see a few photos of finished sweaters from this class, click here.